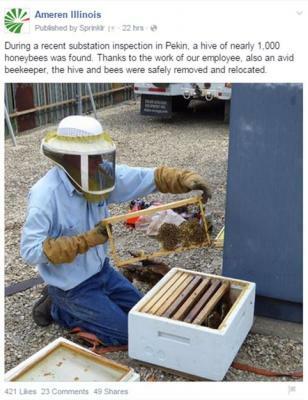 Ameren Illinois workers found a hive a nearly 1,000 honeybees during a recent substation inspection in Pekin. Thanks to the work of their employee, also an avid beekeeper, the hive and bees were safely removed and relocated. A picture is shown on their Facebook page at https://www.facebook.com/AmerenIllinois. Bee swarm and hive discoveries are common occurrences, but unfortunately they can sometimes become a nuisance around homes. It is important to remember that many of these insects are beneficial pollinators and care should be used before destroying them. In the spring and early summer honey bees may swarm in large groups and look threatening to homeowners. In reality, however, these beneficial bees are just searching for a new home. Honeybees are amber or brown and black banded, hairy and about 1/2 inch long. They nest in hollow tree trunks and build colonies that may contain tens of thousands of individuals. When nests get congested, some of the bees will leave in swarms of several hundred looking for new nesting sites, usually in the spring. The bees often form a mass on a tree branch or other support for a few days until a permanent site is found. Control is usually not recommended or necessary, since most of these swarms leave on their own within a few days. Honeybees in swarms are usually docile and those with colonies in trees rarely attack, unless provoked. Swarms that remain after a week may need to be removed by a beekeeper or professional pest control operator. Treating with an insecticide should be used only as a last resort. Also, swarms that start to invade structures may need to be controlled or removed, since the honey and wax can become a serious problem within walls or other void areas of a building. The following websites provide more information on bee warm removal: Heart of Illinois Beekeepers Association at http://hoibees.org/swarms/, Safe Bee Removal at http://www.safebeeremovalexpert.com/illinois/, and Illinois Department of Agriculture's Bees & Apiaries at https://www.agr.state.il.us/bees-apiaries/. Persons with an interest in monitoring bees can go to the University of Illinois website http://beespotter.mste.uiuc.edu to participate in a statewide Citizen Scientist volunteer monitoring and photo recording program.